BUFFALO, NY – Reichert Technologies’ Analytical Instruments Division announces that its Density4 density meter has a specification improvement regarding its accuracy of measurement. The Density4 now provides accuracy of 0.0001 g/cm3, a significant improvement over the previous specification of 0.0005 g/cm3. The Density4 is a compact, robust, stand-alone laboratory instrument with solid state Peltier thermostat temperature control. 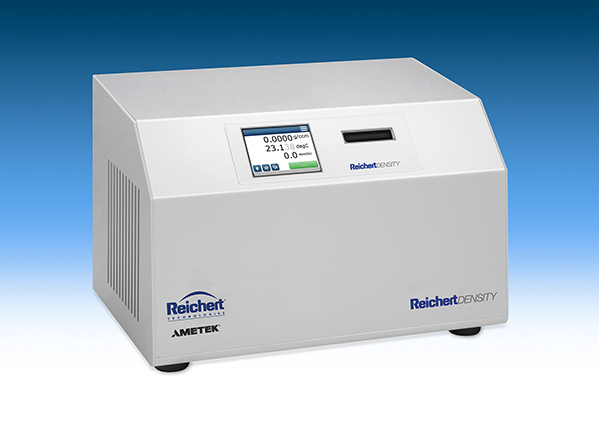 If an application calls for a more sophisticated measurement solution, the modular concept design of the Density4 enables the unit to be connected to Reichert refractometer and polarimeter instruments thru a Universal Color touch display. Another unique feature of the Density4 density meter is its plug and play measurement cell that can be interchanged at the customer's site. This feature reduces measurement downtime and eliminates loss of use. It is no longer necessary to return a density meter back to a factory for this level of service. "Reichert has a tradition of providing robust and reliable analytical instruments to meet the needs of many industries. The Density4 density meter follows in this tradition. Beverage, brewing, chemical, cosmetics, essential oils, foods, fragrances, pharmaceuticals, petroleum, and other industries, all can benefit from this density meter. Product quality can be reliably measured and manufacturing costs reduced," reports Charlie Smith, Sales and Distribution Manager. Through its Analytical Instruments Division, Reichert Technologies offers laboratory and portable/field refractometers for the automotive, food and beverage, chemical, and other industrial markets. Reichert Analytical has created nearly every technologic breakthrough in refractometry, including the Goldberg refractometer, the first and only liquid-filled refractometer that adjusts automatically for temperature compensation. Reichert Technologies, along with its Analytical Instruments Division, is a business unit of AMETEK Ultra Precision Technologies, a division of AMETEK, Inc., a global leader in electronic instruments and electromechanical devices.